There are many misconceptions surrounding alcoholic beverages that can be harmful to anyone who is not aware of what is true and what isn’t. For men, moderation is defined as no more than two drinks a day and for women, no more than one drink a day. Overconsuming of alcoholic beverages increases people’s risk of injuries, violence, drowning, liver disease, and some type of cancer. Each of us can do our part to prevent alcohol misuse or abuse. Fact: False. No matter the amount, whether it’s a 12-ounce bottle of beer, a standard shot of 80-proof liquor (either straight or in a mixed drink) or a 5-ounce glass of wine, the content of alcohol is the same and most likely the effects are too. Fact: Not so. Alcohol is a depressant and not a stimulant. If you do experience a “lift” it tends to have a short-lived effect. Fact: Don’t believe it. Women absorb and metabolize alcohol differently than men. It’s absorbed more quickly due to their body composition and smaller body size. Men have a higher percent body water content compared to women making it easier for a man to naturally dilute alcohol more efficiently, regardless of their weight. Also an enzyme called alcohol dehydrogenase which helps to metabolize alcohol, is less active and is not as prevalent in women as it is in men. Trying to keep up with the guys will only get you more intoxicated and impaired. Fact: It’s the reverse. When you drink alcohol, it tends to increase heat loss from the body making you more susceptible to cold. Fact: Not true. Alcohol can inhibit parts of the central nervous system necessary for sexual arousal and the more you drink, it can lead to problems achieving an erection. However, drinking in moderation (one to two drinks) can help some people overcome sexual inhibitions. Fact: Depending on your weight, it can take up to 3 hours to eliminate the alcohol content of two drinks. The liver can process about ½ ounce of blood ethanol (one drink’s worth) per hour, depending on the person’s body size, gender, and general health. To lessen hangover symptoms, drinking a lot of water or orange juice to replenish hydration may help. Adding a teaspoon of baking soda to water may relieve queasiness associated with hangovers. Eating something simple like eggs, which contain cysteine, may help with symptoms too. The best cure for sobering up though is time. Fact: Possibly. Research suggests consuming a moderate amount of alcohol – moderate defined as no more than one drink a day for women and two drinks a day for men - which includes wine, beer, and hard liquor, may lower the risk of heart disease. The reason for this is moderate amounts of alcohol my help increase the “good” or HDL cholesterol and decrease the “bad” or LDL cholesterol in the body. Moderate amounts may also decrease the risk of blood clotting and possibly lower blood pressure. But, if you currently do not drink alcohol, this does not mean you should take up drinking to achieve heart health. There are healthier ways to reduce heart disease such as eating a nutrient-dense diet, increase exercise and eliminate smoking. Fact: Just the opposite. 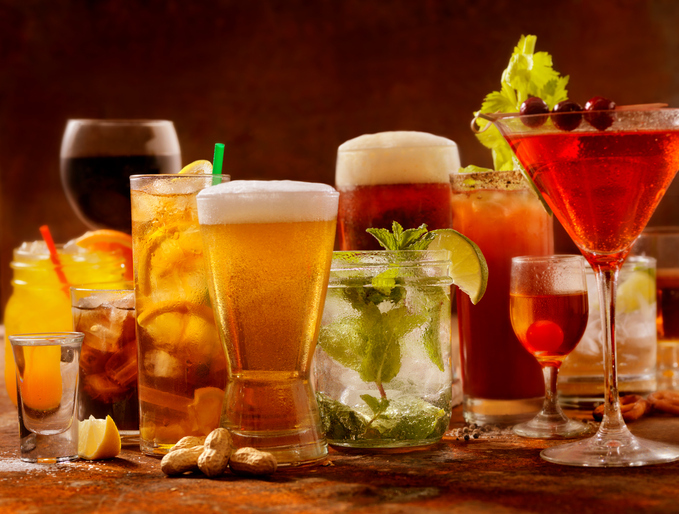 Alcoholic drinks can be more fattening than nonalcoholic drinks. Alcohol contains 7 calories per gram. When your body has to contend with metabolizing both fat and alcohol, your body will store the fat and rids itself of the alcohol by using it for energy. So, alcohol actually promotes fat storage particularly in the central abdominal area giving you a “beer belly” often seen in moderate drinkers. Fact: Very untrue. The more alcohol you drink, the less likely you’ll eat enough food to obtain adequate nutrients. Have you ever seen a “healthy” looking alcoholic? Alcohol contains calories but has few nutrients and replaces eating nutritious foods from the diet. It also impairs nutrient absorption that can cause a deficiency of the B vitamins thiamine and folate. Fact: Totally untrue. “Don’t drink on an empty stomach” is a true statement and everyone should abide by this when drinking alcohol. Eating food before or with a drink slows down the rush of alcohol into the bloodstream. Food, especially if it contains fat, delays emptying of the stomach into the small intestine. This delay allows time for enzymes in the stomach to work on digesting the contents. Having food within the stomach also helps to dilute and lower the concentration of alcohol and slows the rate of absorption of it. All of us have to decide as individuals whether we choose to drink alcohol or not. If those who choose to consume alcoholic beverages would always do so in moderation, we would not have the problems often associated with them. The best and surest way to avoid the harmful effects of alcohol is to decline and restrict your intake of these beverages. And remember, if you do choose to drink, always do so with care and only in moderation.